JAXA (Japan Aerospace Exploration Agency) has set a goal of constructing a manned lunar base in 2030 said Satoki Kurokawa, a spokesman for JAXA, who revealed the ambition to an international conference in Tokyo this week, but added the agency has not yet prepared the budget for the project. JAXA hopes to launch a satellite into lunar orbit next year, followed by an unmanned spacecraft that will land on the Moon and a probe ship that will collect and return lunar samples. Under the plan, astronauts would be sent to the Moon by around 2020 so that they will start construction of the base to be completed by 2030, the Kurokawa said. 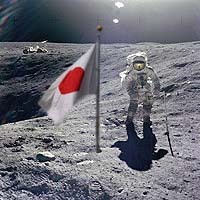 JAXA earlier had given 2025 as the target date for a lunar base. "The feasibility of the plan is unclear at this point as we need to gain understanding by the government and the Japanese people on our plan, but technologically it would be possible in a few decades," Kurokawa said. "Exploring a frontier is always a mission of science. In addition, space programs have the potential to create cutting-edge technologies, particularly in the field of robotics," he said, explaining benefits of the program. Japan's space program has been on a rebound with a series of satellite launches after an embarrassment in 2003, when JAXA had to abort a rocket carrying a spy satellite just 10 minutes after liftoff.